She gave me three different types of products. I have been using the facial cleanser to clean my bathroom and turned the facial toner into a air freshener. 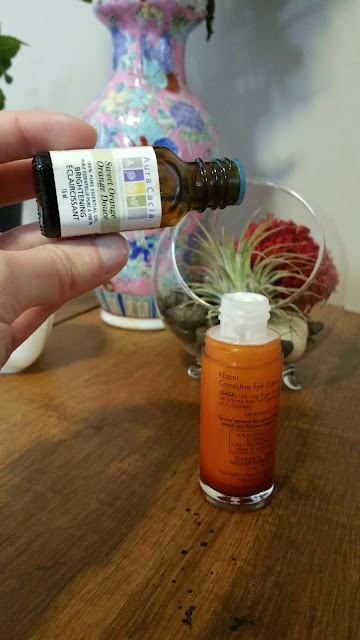 Today I am going to be talking about how I repurposed to facial lotion. When we first moved into our house, I found an antique solid wood round table for sale in an online classified ad. The table had been stripped down to bare wood. The previous owner had had every intention to re-do the table but never got around to it. Personally, I love the look of bare wood. I'm not really into lacquer, varnish, or stain. But of course, a bare wood surface is also vulnerable to staining and scratching. I had to figure out a way to protect it, and furniture polish was definitely they key. I have been using my own homemade furniture polish for a few years now, and my table looks absolutely amazing. It looks hydrated and has just the slightest sheen. It also feels like silk when you run your fingers across it, it's not sticky or tacky, just smooth. 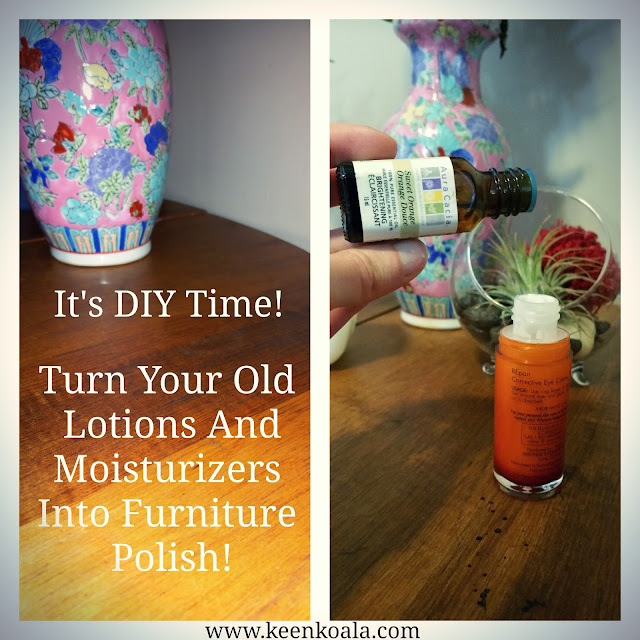 So, without further adieu, here is how you can repurpose some old lotion into a fabulous furniture polish. - Old lotion, cream, or moisturizer. It doesn't even have to be old lotion, if you have something laying around that just didn't agree with your skin, you can definitely use it for this project! Wood is far less picky than skin! - Orange, tangerine, or sweet orange essential oil. - Remove the lid from your lotion bottle or cream container. - Add 10-20 drops of the orange essential oil to your lotion. - Recap the lotion and shake it vigorously to combine the essential oil and lotion. 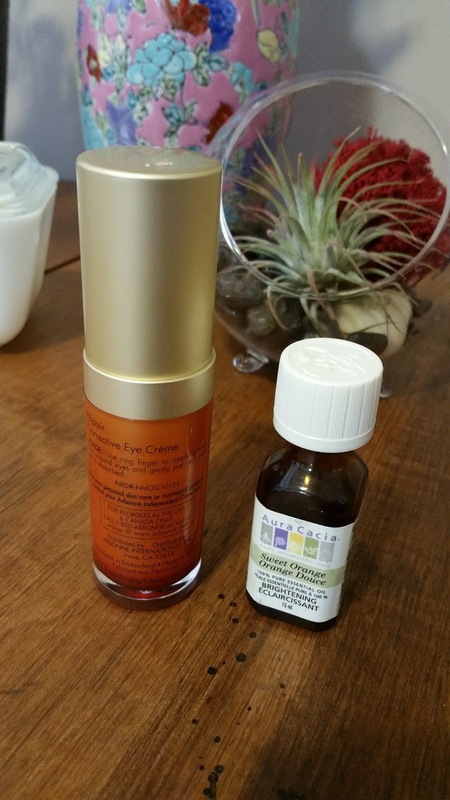 If you are using a cream, then you will need to find a small utensil to manually mix the cream and essential oil together because it's much thicker, but it will still work great! Now that you've finished making your furniture polish, it's time to use it. Dispense a quarter-size amount onto a soft cloth and rub it into your wood surface. I like to determine which way the grain is going and then follow along the grain. Keep polishing gently until the polish is completely buffed in. You don't want to leave any globs or streaks, as these may become sticky. Run your bare hand across the surface to ensure that you haven't left any tacky spots. Your surface should be left with a slight sheen and a hydrated look. The orange oil also makes it smell amazing! 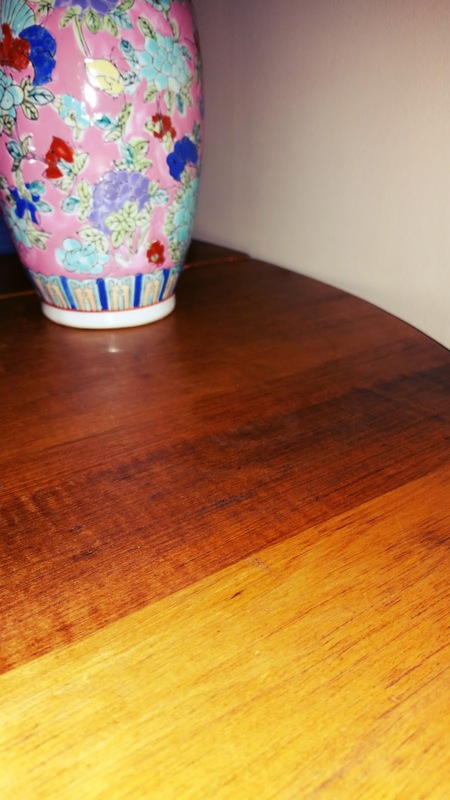 Just a word of caution, furniture polish can darken the look of wood ever so slightly. This indeed happened to my table, but I absolutely adore how it looks now. It looks so rich and lustrous. I like polish my table 1-2 times per week to keep it looking clean, fresh, and beautiful. I find that caring for my wood this way keeps it very clean and protects the surface from minor scratches and stains. After you try this tutorial, let me know what you think in the comments section below, I would love to hear from you! For more great tutorials and instant access to exclusive content and contests, please LIKE Keen Koala on Facebook by clicking HERE.